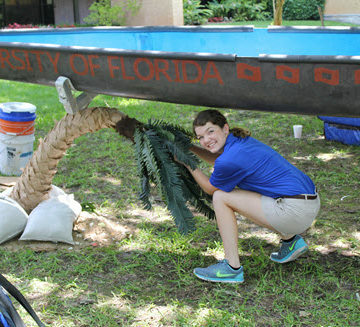 The University of Florida is looking to repeat as National Concrete Canoe Competition champions. 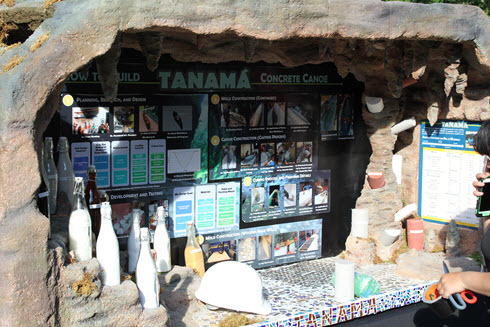 There was reason to expect the ASCE 2016 National Concrete Canoe Competition to have a different – less colorful – look. The new rules for this year’s event prohibit teams from using concrete stains, previously a popular way for students to decorate their canoes and hide cracks. But Display Day opened the competition, June 9, at the University of Texas at Tyler in Tyler, TX, and the canoes were full of color and innovation as always. If the new rules presented both an aesthetic and technical challenge, then the students more than compensated. This year’s competition – the 29th annual – features 21 schools competing for three days. Academic judging consists of 75 percent of each team’s final score. 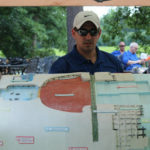 The other 25 percent of the score comes from the results of the races, scheduled to run Saturday, June 11 at Lake Tyler. The 2016 rules did allow teams to use adhesives for lettering, as well as clear concrete sealers that produce a nice sheen. Any other color in the designs had to be pigments mixed into the concrete. The timing of rule change could not have been worse for Emily Waldon, one of two head captains for the Southern Illinois University Carbondale team. 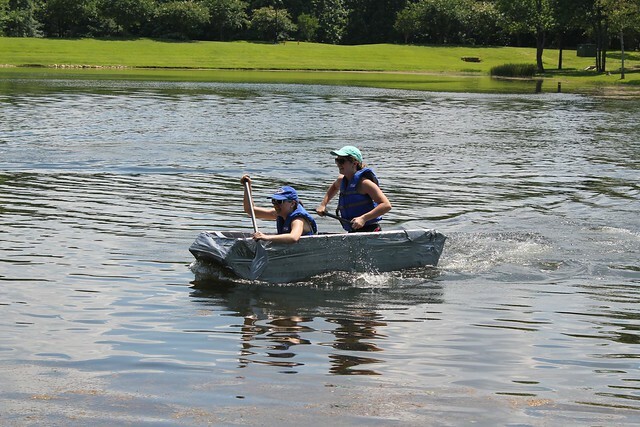 After displaying what was the only solid-single-color canoe at the 2015 NCCC, the squad had a vision for this year’s design. So when they learned about the no-stains rule, they did what all good engineers do – adjust. They developed a pigment they could mix in and a simple but attractive three-color design. Red, white, and blue. Perfect for their election-themed canoe. The competition opened with the canoe weigh-in and swamp tests. The lightest canoe this year was the 113-pound entry from Université Laval. The heaviest was the 793-pound canoe, named Écrevisse, from McNeese State University. McNeese initially did not qualify for Nationals, finishing second in the Deep South regional. But when the winning team was disqualified, McNeese happily accepted the berth. 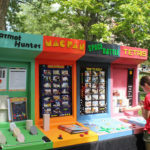 “The students were really excited. They couldn’t believe it,” said Dimitrios Dermisis, McNeese Student Chapter adviser. “They’ve worked for almost a year for this. The University of California, Los Angeles team was among the many that made sustainability a priority in its canoe this year. UCLA used more fly ash and less cement in its mix. “By reducing the amount of cement we use – even if it’s by a little – it can have huge impact globally,” said team member Maxwell Armenta. For its display, the UCLA team reused old shelves, stands, and wood that the school was throwing away. The University of Puerto Rico, Mayaguez display garnered a lot of attention. Canada is represented at Nationals by École de technologie supérieure and Université Laval. But only the University of Puerto Rico, Mayagüez team traveled overseas to get their canoe to Texas. They shipped their canoe to Jacksonville, FL, two weeks in advance; then drove it over by trailer this week. “Having the honor to be with these great universities, it’s very exciting,” said Yaileen Acevedo, Mayagüez team member. It is the school’s third year at the Nationals. Acevedo is proud of the structural improvements the team made to this year’s canoe, including a keel, new rib placements, and a flat bottom. In the world of sports, “just happy to be there” usually refers to underdogs. 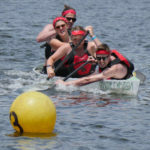 Western Kentucky University’s concrete canoe team can’t be termed an underdog – the Hilltoppers have qualified for Nationals 17 times, including a fourth-place finish in 2007. But in a very literal sense, after a blown tire and a shot transmission during the trip from Bowling Green, KY, the WKU squad was just happy to be here. The flat tire on the trailer was an easy fix. The loud humming sound from the truck was not. “It sounded like the truck was dragging a rock,” said Western Kentucky senior Zach Thorpe. The team was still two hours away – near the Texas-Arkansas border. Fortunately, officials from UT-Tyler sent out a rescue truck to bring the WKU team and canoe into town. Thursday morning, Western students returned the favor to the host UT-Tyler team, helping them carry their canoe to the weigh-in. The University of Maryland speakeasy. The team from the University of Maryland was easy to spot Thursday during Display Day activities. Most of the team members were dressed in 1920s prohibition-era costumes – despite the Texas heat – befitting their Whiskey River canoe’s theme. “We got together and picked the name. 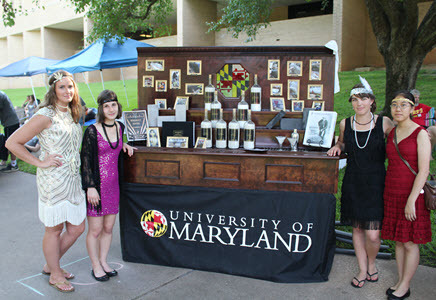 I was happy with it because I’m obsessed with the 1920s,” laughed Maryland senior Nicole Michael. Last year, Maryland qualified for Nationals with a Preakness/Sea Biscuit canoe, and team members wore their best horse-race finery. The UT-Tyler team, in addition to rescuing the Western Kentucky University team from truck troubles and hosting the competition’s 21 schools and more than 350 students, made concrete canoe history by entering a canoe in two pieces. 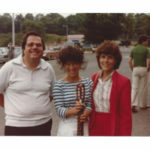 The team employed an interlocking system of concrete pins to unite the two-piece canoe. They even built a drawbridge of sorts to display it.